Any writer will tell you that crafting a novel, short story, or other creative work can leave a person filled with angst and feeling isolated. We stare at the computer screen or the blank notebook page and eventually put our emotions on the line, not knowing whether what we’re producing is of publishable quality or a waste of time. Writers are competitive. Many wall themselves off. Few whose names appear on the spines of books you’ll see on the shelves at Barnes and Noble will help a writer trying to get established. I could tell you some stories, but I won’t. That’s why being a member of a book club is critical. 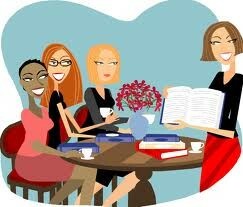 The majority of the women in my book club are not writers. They are book lovers. We meet at each other’s homes once a month for potluck, a glass of wine or two (or three) and a spirited conversation about that month’s book selection. They have lifted my spirits when I’ve become discouraged about my writing and heave unwittingly helped me with my craft through the remarks they make about the month’s book selection. They have read my entire novel in progress, The Talking Drum, and were brutally honest in their critique. Months into my latest revision, I am still reviewing their suggestions and weaving them into the manuscript. They also rallied around me when my story came out in Chicken Soup for the Soul: The Dating Game a few months ago. This is the kind of support a writer needs, especially one such as myself, who’s trying to get a foothold in the industry. This entry was posted in Book Club, Writing and tagged Chicken Soup for the Soul. Bookmark the permalink. You are a “gem”, Lisa. You are truly a asset to our reading club.